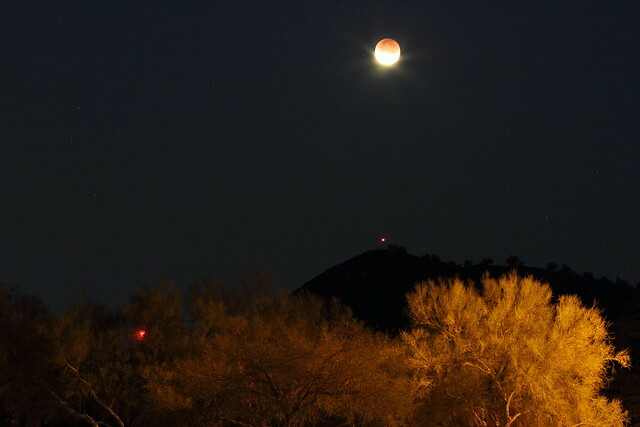 Please post your December 2011 lunar eclipse images here. Oh it was so beautiful! Went out at 5:30am (ouch!) and drove a few miles north, to Eleven Mile Reservoir, on the east edge of South Park (yes, that South Park). I climbed a 30 meter rock formation above the lake (interesting in the dark), and fought to keep my camera batteries working at -18°C (fought to keep my fingers working, as well). But I managed a few nice shots. Last edited by Chris Peterson on Sat Dec 10, 2011 6:58 pm, edited 1 time in total. Seen from a rooftop in San Francisco's Marina district. I'm jealous. The moon was well below the horizon here in New York during the eclipse. Nice photos, you all. 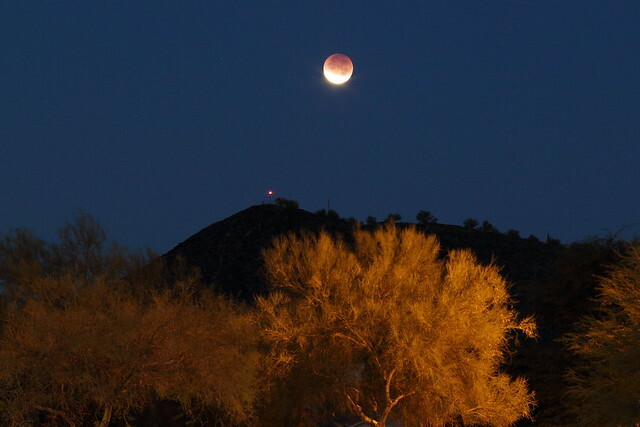 The December 10, 2011 total lunar eclipse was photographed over the Union Hills of North Phoenix. The marker lights for the Deer Valley (KDVT) airport can be seen illuminated on the mountain tops. It was incredible to see the fully eclipsed moon set behind the mountain peaks. Most photographs were taken with a Canon t2i and a Canon f/2.0 100 mm prime lens. Philopappou hill, the opposite hill to the Acropolis of Athens offered a good perspective to capture todays eclipse above the Parthenon. 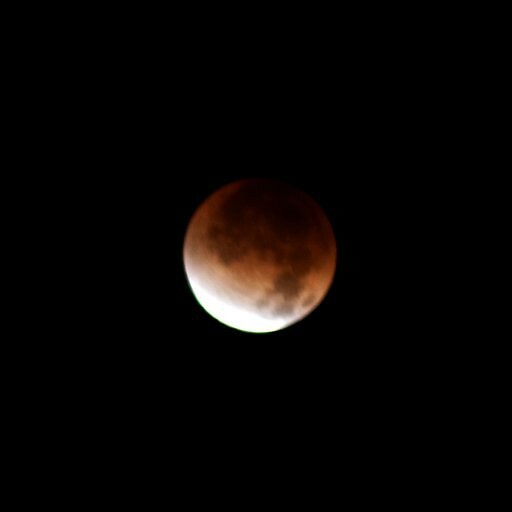 Totality was invisible in Greece, as the moon rose after the end of it, but the moonrise of the partial phase was very beautiful! Here is my album of the eclipse as seen from India. Last edited by nuclearcat on Sun Dec 11, 2011 1:22 am, edited 2 times in total. In addition to the one photograph of the eclipsed Moon during twilight in SW Poland which was kidly re-directed above, in the link below there are a few more. The moon began its exit from the umbral shadow this evening approximately ten minutes prior to its first appearance over Athens. The image above was taken from Philopappou Hill which lies southwest of the Acropolis and the 2500 yr-old Parthenon. In Italy this eclipse was nearly invisible: the Moon rised near the end of the partial phase. 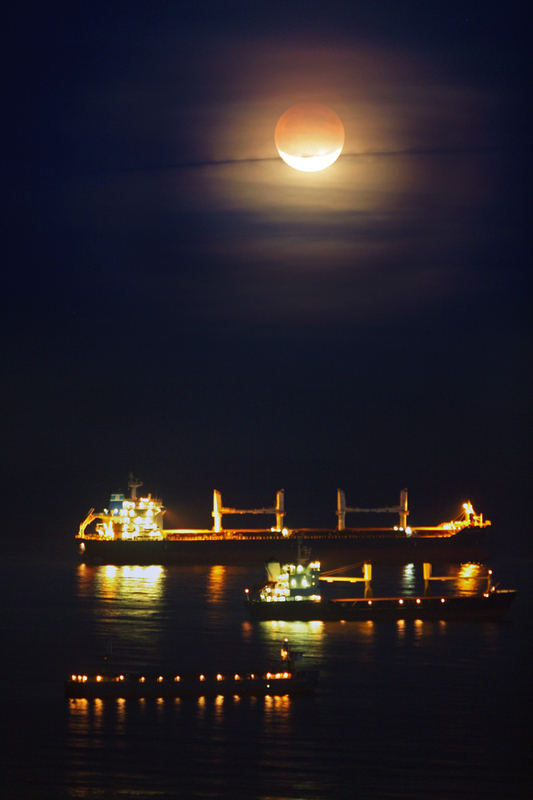 These images show the Moon rising over my home town, Tradate, near Milan, Italy. 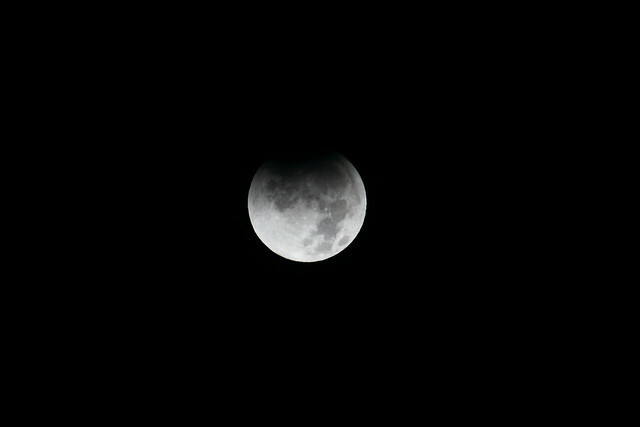 Photo details: Canon 350D, 200 mm f/11, 400 ISO, UT time (and exp): 16.01 (1.3 s), 16.03 (1/2 s), 16.10 (2.5 s). 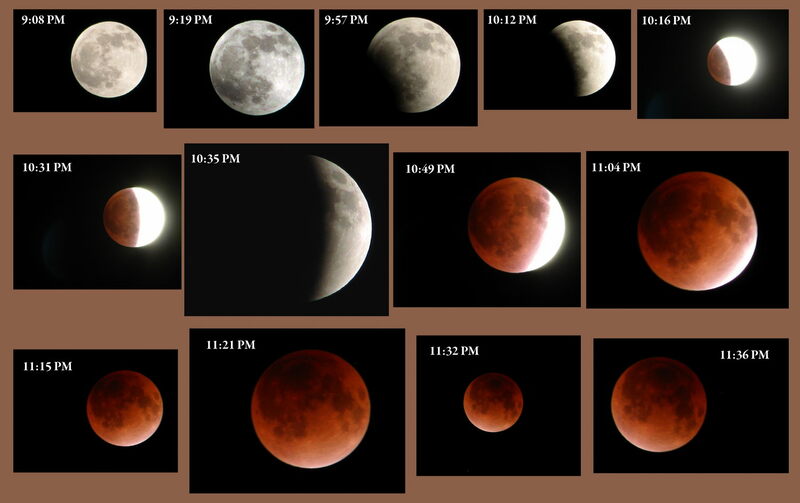 Here is a collage of the eclipse from photos I took last night here in Mitaka, City, Tokyo, Japan. 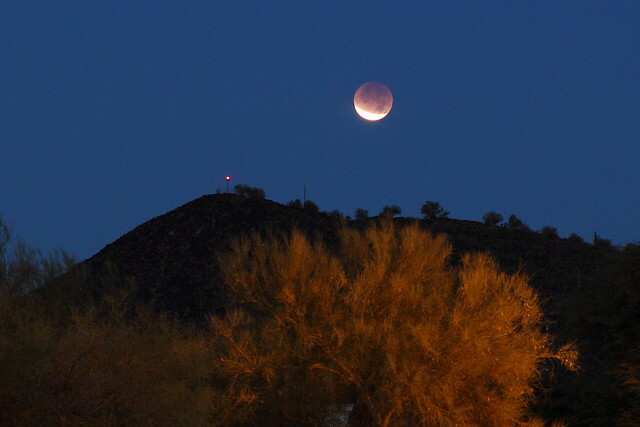 We watched the almost-completely-eclipsed moon set over South Mountain, from Ahwatukee, in suburban Phoenix, Arizona. Three pictures to share-- ordered by time and by zoom level. Photos taken with a tripod mounted Panasonic Lumix with max 24x zoom, and exposure times ranging between about 1/2 second and 2 seconds at f/5 or so. Time stamps are from 6:54 to 6:57 am (UT - 7), but I haven't calibrated the camera's clock that accurately. Images by and copyright James Rhoads; feel free to share but please carry the photo credit along. 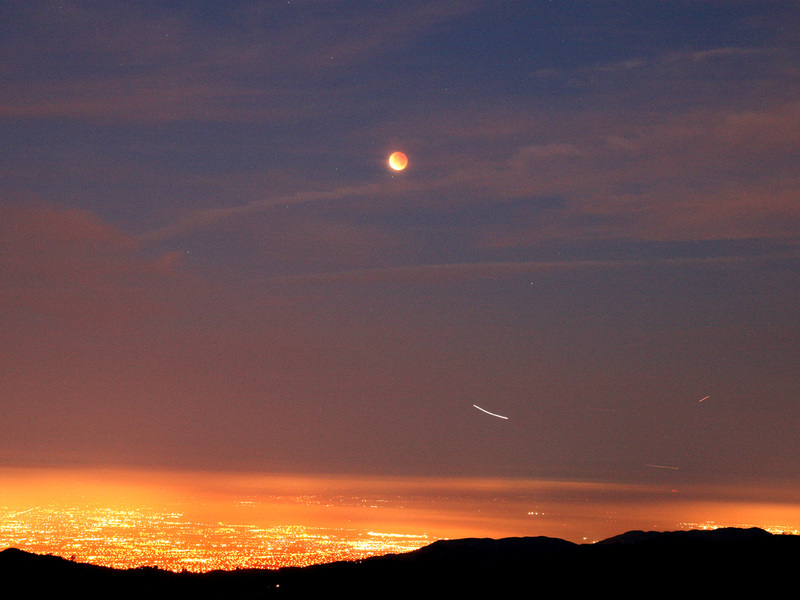 Total Lunar Eclipse Dec. 10, 2011 from Mt. Hamilton, CA -- just west of Lick Observatory. Lights of San Jose, CA. below. Aircraft tracks from planes departing San Jose Mineta International Airport. Canon XTi DSLR, Canon 17-55@45mm FL, f5, 5 sec, ISO 800. 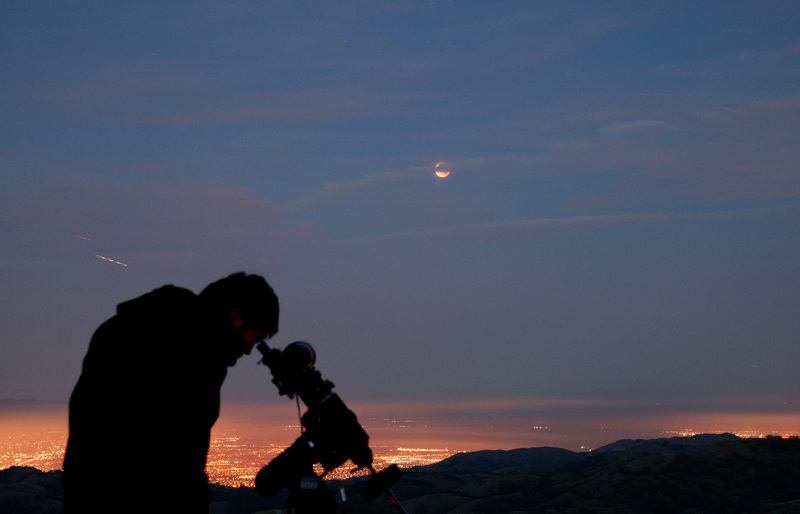 Brent Baldridge observes the eclipse through an 80mm Stellarvue ED Refractor on an Orion Atlas EQ mount. Friends tell me the eclipse was beautiful in Hawaii, my home state. Does anyone have photos from there to post? 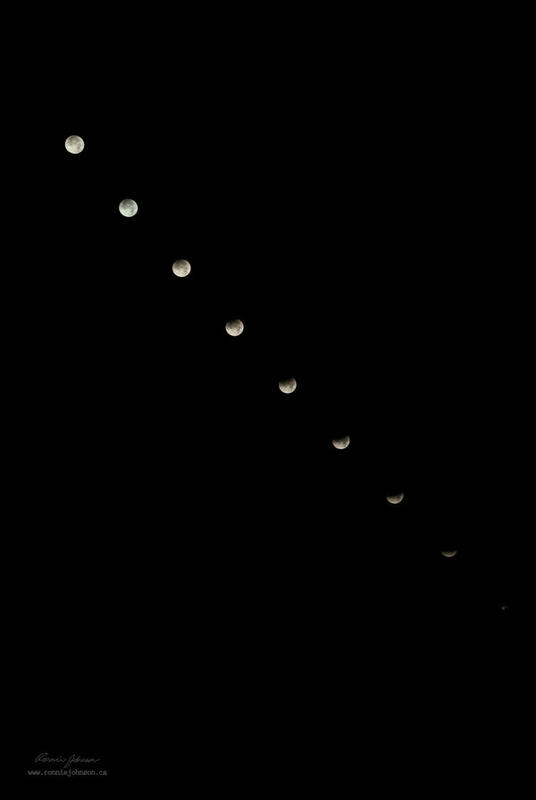 I actually didn't get up to watch it, but I did however set up my camera for 10min intervals. Woke up in the morning to see that the photos worked out and with some editing this is what I got.